Trainers, now that 2019 is underway, we at Go Hub would like to take a minute to appreciate the year that was 2018 in Pokémon Go. One of our talented artists, OrangeHeart, has put together this amazing info-graphic detailing all the wonderful events that took place in Pokémon Go during the last year. This is your Pokemon GO 2018 overview you never asked for! Take a look at the massive timeline created below and then share what your favorite memory of 2018 was in the comments section below. January 23: a new wave of Generation III Pokemon is released, featuring Ground type Pokemon. Along with it, the release of shiny Aron! February 9: Rayquaza raids begin, unleashing the lord of the Sky. Rayquaza’s arrival has triggered a release of new wave of Gen 3 Pokemon, featuring Flying and Dragon types. Shiny Swablu was released alongside this wave! February 26: A special Festive Day Pikachu is released for Pokemon Day event alongside it’s shiny variant. Japan has the opportunity to raid a special Nidoking raid featuring Giovanni’s Nidoking. Chiayi Safari Zone takes place. March 5: Special egg event begins featuring Pokemon that favor Windy weather due to Rayquaza winning Legendary Week’s competition. We also got to enjoy double XP for 8 whole days! March 16: Lugia raids begin again, marking Lugia’s return to Pokemon GO and added its shiny counterpart. March 30: Field Research is released! For the first time ever, Trainers can participate in Professor Willow’s research assignments. The first special research assignment becomes available, unlocking Mew in Pokemon GO. April 2: Latios and Latias raids begin, with availability depending on the region you live in. April 10: The Kanto week eevent starts, featuring increased spawns of Generation 1 starters and Pikachu. May 1: Fighting Showdown event, featuring double XP for fighting gyms and doing raids along with a double badge multiplier for Gym Badges, allowing you to get those gold badges a lot faster! Shiny Makuhita and shiny Meditite fought their way into the wild for the first time! June 21: Lunatone and Solrock switch places, Regice raids begin, Niantic releases a surprising new feature: Friendship system and Trading in Pokemon GO. Alolan Pokemon were also added in a brand new egg type – 7km eggs! June 23: Suddenly in the middle of the night, Alolan Rattata shows up and wreaks havoc among many players sightings! June 30: A series of Global Research Challenge events begins, featuring challenges for players participating in real world events and for other players around the globe. Dortmund Safari Zone takes place. 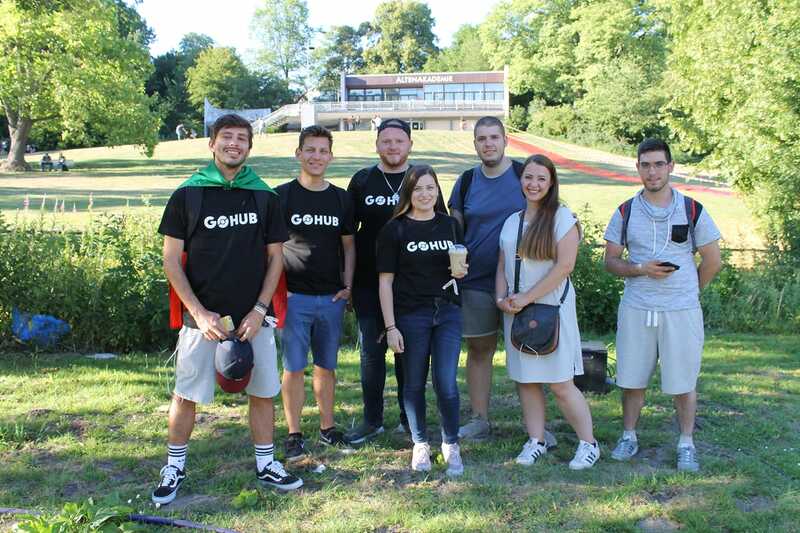 Several members of GO Hub’s European team meet IRL for the first time ever. July 7: Articuno raid day takes place, featuring three hours of Articuno raids and a shiny Articuno becomes available. July 8: Squirtle Community Day takes place, featuring a shiny Squirtle and Hydro Cannon Water as Blastoise exclusive move. A special fan-requested Squirtle wearing sunglasses was featured during the three-hour window via quests. A guranteed shiny was available for this for all players from certain stops. July 14: GO Fest 2018 takes place in Chicago, unlocking shiny Plusle and Minun. Event goes through without any problems, participants get a Celebi. 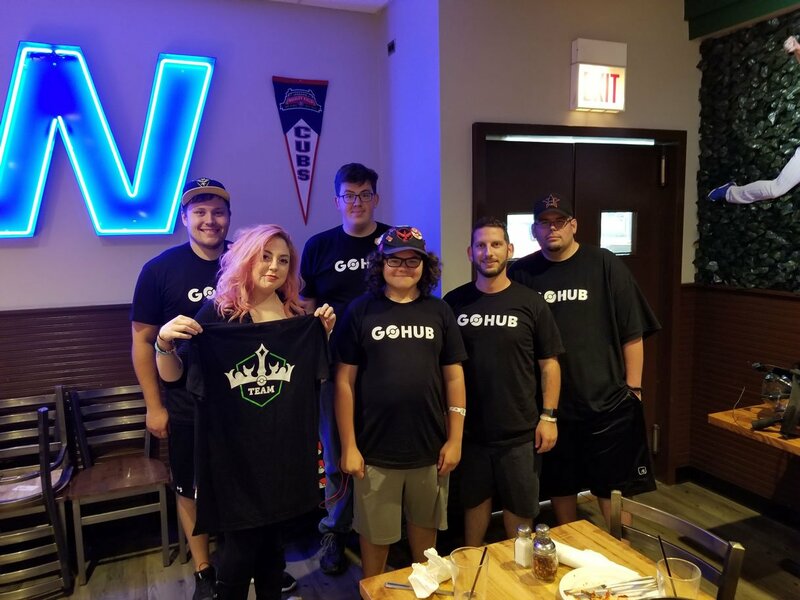 A large group of GO Hub members from the US meets for the first time in Chicago. Everyone hates Boon for not coming. Alolan Geodude and Diglett were also released into the wild! July 19: Registeel raids begin, featuring the trash can Pokemon Registeel. July 21: Zapdos day takes place, featuring Zapdos raids for three hours and unlocking a shiny Zapdos. Zapdos exclusive move is a fast move: Thunder Bolt Electric, which is significant upgrade over Charge Beam. July 25: Lucky Pokemon go live! A surprising feature that ties into trading is released. August 11: Eevee community day takes place, featuring shiny Eevee and Last Resort Normal as Eeveelution exclusive move. Shiny Jolteon, Flareon, Vaporeon, Umbreon and Espeon become available. August 15: Niantic Kids rolled out, allowing children under the age of 13 to access the friends feature and trading. Parents could limit their children’s capabilities through a special website. August 20: Celebi is released worldwide! A new special research quest line starts, featuring Professor Willow and the balance of nature. Celebi’s arrivals kicks off the Johto festival, an event featuring Generation II starters and unlocking shiny Pineco, shiny Natu and shiny Sunkern. August 29: Safari Zone Yokosuka takes place, featuring various regional Pokemon and Gen 3 starters. Shiny Wingull becomes available. September 12: Pokestop submissions beta finally starts in Pokemon GO! September 13: Global Research Challenge Ultra Bonus is unlocked as players have defeated all summer research challenges. Zapdos, Moltres, Articuno and Mewtwo raids are rewarded. A special event started featuring Kanto Pokemon (again) and along with that, shiny Grimer and Geodude was released too. September 14: Pokemon GO Week in Korea takes place, featuring a week long increased spawns. September 20: Mewtwo starts appearing in regular raids. The grind is on. September 25: a mysterious Pokemon Meltan is revealed. September 27: Deoxys becomes the new EX Raid Boss. October 5: Psychic Spectacular event takes place, featuring increased Psychic Pokemon spawns. Shiny Drowzee is released! October 16: First wave of Gen IV Pokemon is released, along with adding shiny Shinx in raids! October 21: Beldum Community Day takes place, featuring a shiny Beldum. Metagross exclusive move is Meteor Mash Steel, a spectacular Steel type charge move that makes Metagross Meta relevant again. October 23: Giratina raids begin. Halloween event starts in Pokemon GO, bringing more Gen IV Pokemon, shiny Drifloon and a Witch hat Pikachu makes a return along with a chance of encountering it’s shiny variant. Spiritomb special research quest line is released. October 24: In a surprising turn of events, Meltan is revealed it can evolve into Melmetal, being the first time ever that a Mythical Pokemon can evolve! November 1: Adventure Sync rolls out, making Pokemon GO the world’s most popular fitness app. Safari Zone takes place in Tainan featuring shiny Pinsir. Shiny Budew also became available in eggs, along with Buizel becoming available in the wild. November 3: Gengar raid day takes place, featuring three hours of Gengar raids. Shiny Gengar is released. Gengar exclusive fast move is Lick Ghost, a move which is on par with the fabled Shadow Claw. November 5: Ingress Prime is released and two new shiny Pokemon are released in Pokemon GO to celebrate two Ingress factions: shiny Ponyta and shiny Cubone. Shiny Alolan Marowak is added to raids to coincide with this. November 6: Stardust Blast event begins! Players farm the hell out of it in quest for ludicrous amounts of Stardust. November 10: Cyndaquil Community day takes place, featuring shiny Cyndaquil and Blast Burn as Typhlosion exclusive move. November 20: Cresselia raids begin, surprising us and everyone else who expected Dialga and Palkia. November 23: Let’s GO raid event, The Eeveelutions and Raichu (Kanto and Alolan) are all in raids, and adds shiny Alolan Raichu to the mix! December 1: Pokemon GO Community Weekend started, bringing back every past Community Day shiny with increased rates for a whole weekend! With a highlighted further boosted rates for a three hour window on the 1st! December 6: Tottori Prefecture Event, from the 6th to the 19th, Alolan Sandshrew and Kantonian Sandshrew were spawning around the Tottori Sand Dunes area. Shiny Sandshrew was released in Japan at this time! December 12: Pokemon GO PvP starts rolling out! After two long years, we can finally fight other players with the Pokemon we collected. December 18: Pokemon GO’s massive Holiday 2018 event starts, featuring different bonuses every 4 days. Heatran is released in Pokemon GO as a T5 raid boss. The post Pokémon GO 2018: A Retrospective appeared first on Pokemon GO Hub.